Nonprofit & Trustee Director’s Alert! Watch your organization’s reputation. Nonprofit & Trustee Directors Alert! Watch your organization’s reputation. In contrast to business firms, nonprofit and trustee boards can be against a brick wall when the reputations of their organizations go south. In the commercial environment, the directors can be in a position to take swift actions to halt the decline, as Tylenol did in the 1980s when outsiders compromised its products. Nonprofits have a built in problems to acting with the same alacrity. Directors and chairs rotate too frequently. In additional, for-profit organizations often have the financial resources to retain outside counsel. Few nonprofit organizations can afford the same action level and support. * At the minimum, have some modest crisis management plan in place. Review it annually. *Appoint someone to monitor Internet information sources. Some monitoring sources are free, like Google Alerts, and the service does a good job recording most Internet citations where your organization is mentioned. Other fee paid services are available. Alert all board members to the reputational risk issue. Even unsubstantiated rumors need to be brought to the director’s and management attention immediately. Have an internal “hot line” available so that volunteers and employees can report information without embarrassment. Require the CEO to immediately report all reputational comments to the board chair, so that the two can review the information and take action. ATTENTION CANADIAN READERS: I have international readers ever day, but I am pleased to report that Canadians consistently account for 10% or more of all readers. I would appreciate your comments on the issues that draw Canadians to my blog. Thanks. 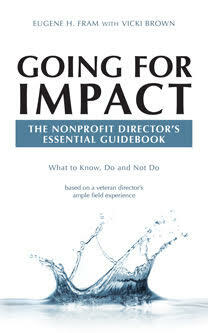 ← What can a nonprofit board of directors do about “displaced directors”?